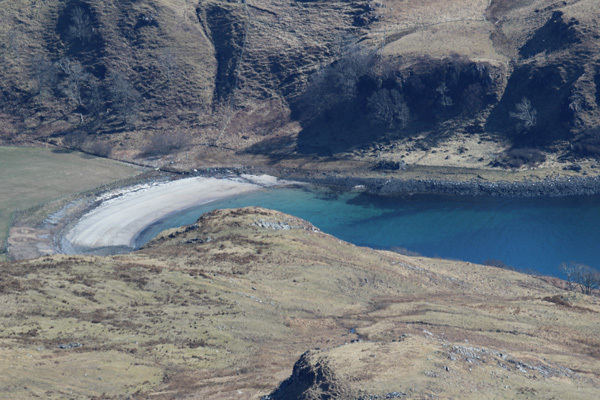 Ben Hiant epitomises the complex geology of the Ardnamurchan region being a conglomeration of quartz-dolerite, breccias, pitchstone, basalt lavas, cone sheets and Moine schist. These rock formations bear evidence of later sculpturing by ice. 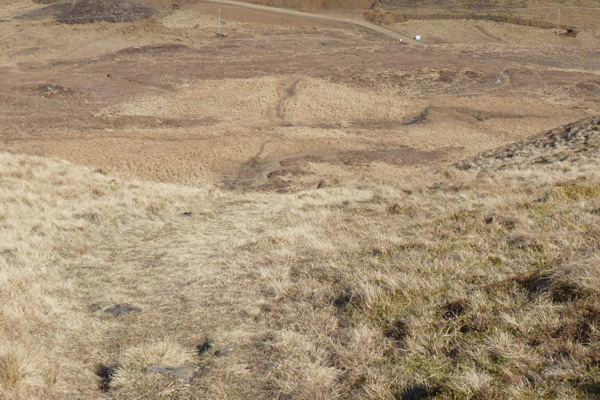 Habitat types associated with Ben Hiant include wet heath, dry heath and upland grassland. The grassland includes Festuca ovina-Agrostis capillaris-Galium saxatile grassland and Nardus stricta-Galium saxatile grassland. Look out for diverse bryophyte assemblages that include woolly hair moss (Racomitrium lanuginosum). The schists support a diversity of montane flora, including locally abundant populations of Northern rock cress (Cardaminopsis petraea). 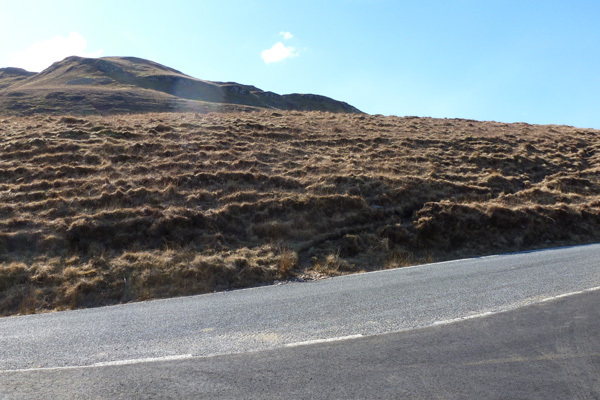 Species most notable on route include Calluna vulgaris, purple moor grass, crowberry (Empetrum nigrum) and bog myrtle. 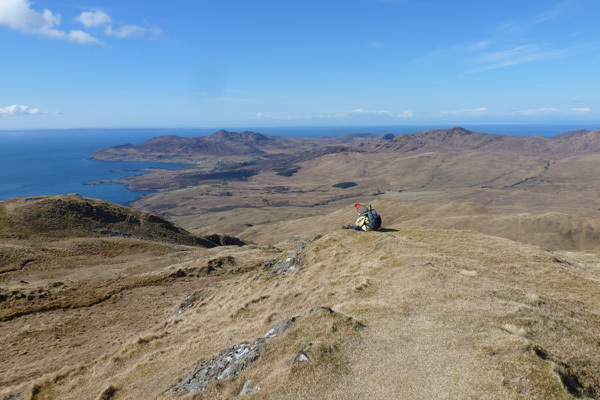 Ben Hiant has been designated as an SSSI for its geological features and flora. 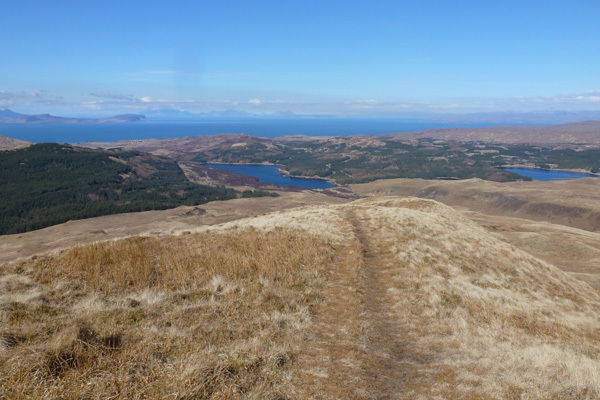 This is a lovely low level hill walk with stunning views on a fine day of the Small Isles, Mull and Skye, Loch Sunart and Loch Teacius, and the hills of Morvern. 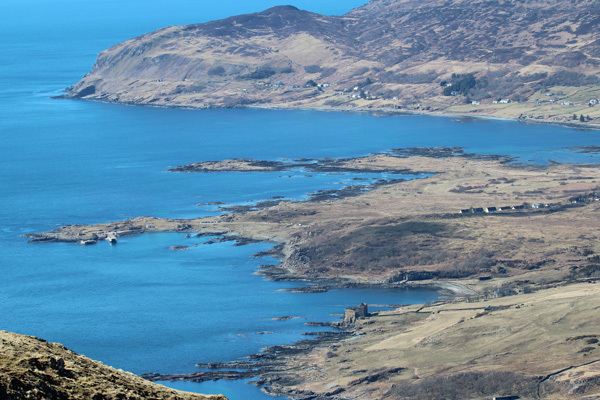 On the Ardnamurchan peninsula, good views are also afforded of Camus nan Geall and the deserted village of Bourblaige by Kilchoan (a victim of the Highland Clearances in the 19th century) as well as Mingary Castle. Bourblaige village consists of the remains of 28 drystone buildings (houses, barns and byres) scattered over the hillside, with the lazy beds still visible. 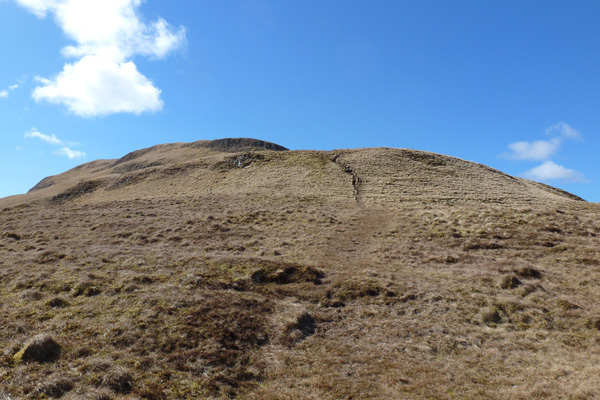 A gentle ascent along a fairly distinctive path but with a few steep and vertiginous sections, requiring a little scrambling in places. There are also some very boggy sections. 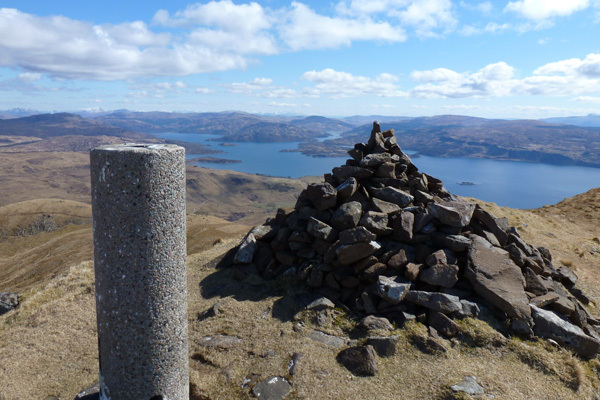 The summit is marked by a cairn and a concrete triangulation station. The walk is best done after a period of dry weather and a fine day. 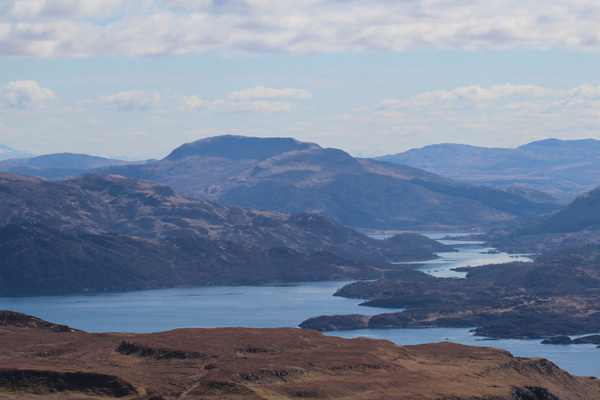 Look out for signs of pine marten, wild cat, red deer and scan the skyline for raptors (including golden eagles) and corvids. 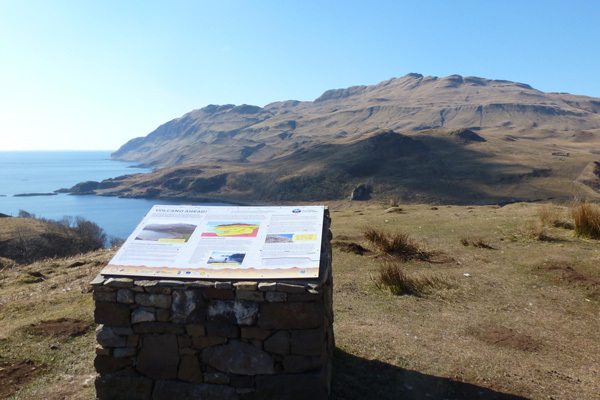 A stunning walk on a bright day affording panoramic views at the summit and geological and botanic interest on route. Park at the wide- splayed track just off the B8007. The start of the walk is immediately opposite the tarmacs area on a small gravel track that veers right and heads uphill. The path is fairly distinct in most places and ascends through heathland to upland grassland. 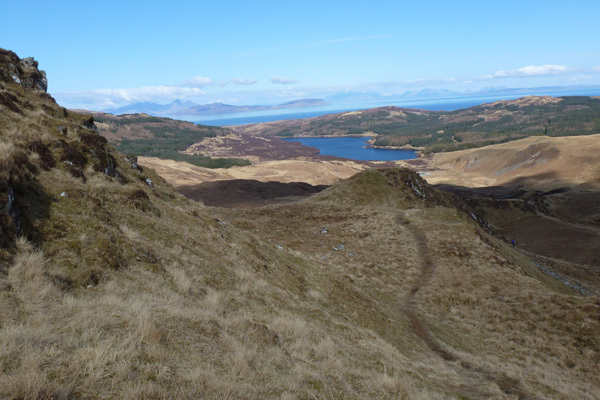 There are some level sections as well as some steep sections requiring a little bit of scrambling. The path can be boggy and slippery in places, so please take care. 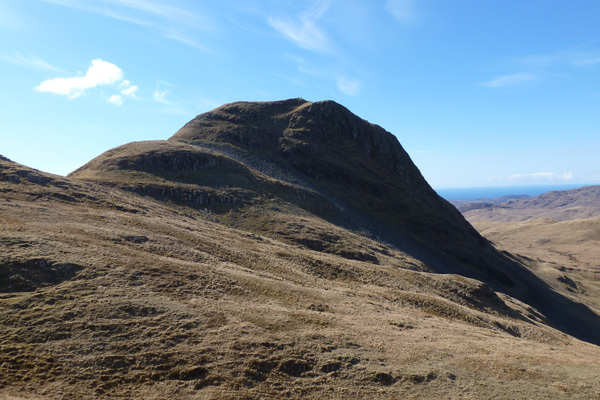 The summit is reached from behind on a gentle ascending path, with the summit soon coming into view with cairn and triangulation station. Return by the same route, taking particular care on the descent.